As-salamu alaykum and hello everyone ♡. Just a quick post on a little fabulous find. Last week I saw a Facebook page of Philosophy Malaysia. I was not sure if that official, until now I gain some trust. So yes, Philosophy brand is now available in Malaysia. i don't really know about this brand, but I heard a lot of raves from the Youtuber years ago. Especially to their best seller Grace fragrance, and Purity facial cleanser. From what I know Philosophy is a brand that sells skincare items and bath products, packaged in a very simple and humble packaging with "Times New Roman" font on it.It looks pretty sleek to me! So I am happy to know that this brand is now officially available in Malaysia since I have a few wishlist from this brand. 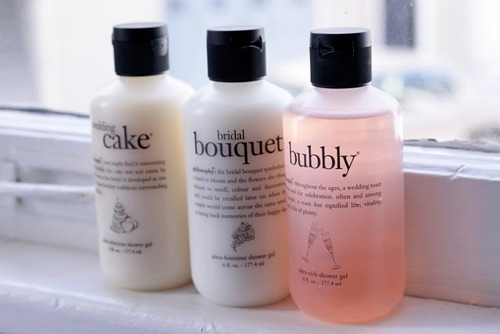 I really want to try the Purity facial cleanser and some body shower from the,\m About price, I don't really know yet. I have not seen it live in Sephora yet. So hopefully it will be not too overpriced! I hope I ncan try the Purity facial cleanser soon! It cost 42USD in the US, so I'm guessing the cleanser gonna cost 3 figure here. Hm... *all image are from WeHeartIt. Have you heard about Philosophy brand? Any wishlist? Yeay!hopefully sephora won't markup too much for the price. please please jangan goda kami dengan packaging comel. Simple je dia punya packaging , but looks sweet . btw I dh cuba tuto tu , and its not work . Hmm , dah lama dalam dilemma ni . Hope someone could figure it out . Oh...i also saw Philosophy in Cleo magazine which has complimentary sephora catalog for christmas. And I thought they were already selling at sephora.